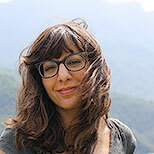 Carolina Ebeid is the 2012–2014 Stadler Fellow at Bucknell University. She holds a degree from the Michener Center for Writers, and is co-poetry editor at Better: Culture & Lit. Recent work appears in The Kenyon Review, Gulf Coast, Indiana Review, and Iron Horse Literary Review.